We are located on plot 8 left Lane Mayango, Entebbe close to Lake Victoria the biggest fresh water Lake in Africa. One can enjoy its beach side amenities including restaurants, bars and other water sport activities like fishing, kayaking, and boat cruise. Our rooms come inform of single, double and triple categories and all include; four poster bed with mosquito net, fan, work desk and seating area. Our restaurant serves fresh homemade breakfast, lunch and dinner. Tour arrangements within Uganda and the rest of East African National Parks. Resturant, bar, gardens, Wifi (free), x1 airport transfer, baby cots, gift shop. 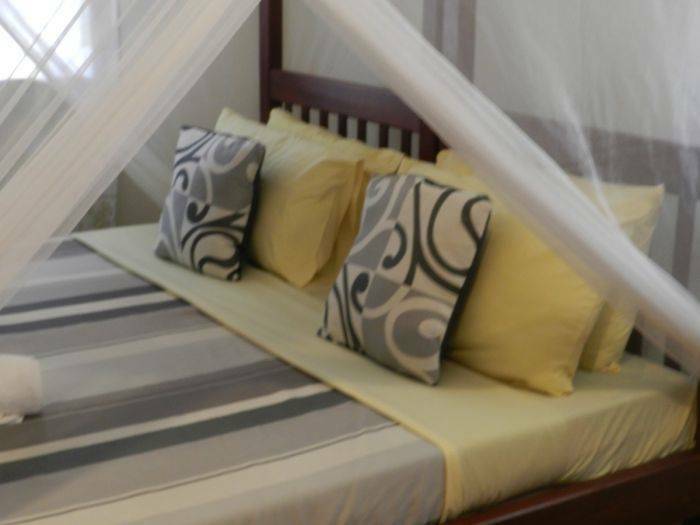 Our rooms vary but most include; four poster bed with mosquito net, fan, work desk and seating area. We are located on plot 8 left Lane Mayango, Entebbe close to Lake Victoria the biggest fresh water Lake in Africa. One can enjoy its beach side amenities including restaurants, bars and other water sport activities like fishing, kayaking, and boat cruise. 100% cancellation for no shows. African Roots Guest House is situated along Entebbe high way (katabi center) and our accessibility is quite easy. Turn right from Airport side and a left from Kampala side at our eye catching yellow sign post by the main road. Drive 300m in where you will see a second sign post on your right and will lead you to the guest house.